Flu season is in full swing. I got my flu shot last fall, but they are saying it wasn’t the correct strain. OK. Some protection is better than none, but I am hoping this year will be as mild as last year, but in any case, I like to be prepared. And I like to know my bathroom is clean. The easier THAT chore is the better. 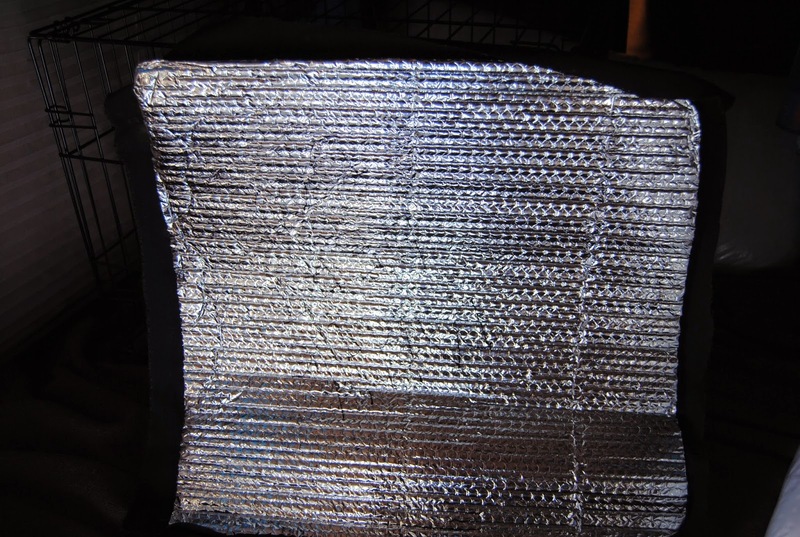 The more cost effective and chemical free the better. Here’s a great cleaning hack from One Good Thing that I have found to be exceptionally cost effective and works great. Homemade Cleaning Wipes. Old T-shirts cut up into wipe-size pieces. Even a little larger won’t hurt. Stack your T-shirt pieces into a glass or plastic container with a tight fitting lid. I used an empty plastic coffee “can”. Mix all the ingredients together and pour over the T-shirt pieces. Every once in awhile, if I remember, I turn the can upside down just in case the wipes need to be remoistened. I stuffed so many in the can that I don’t think there is any of the mixture settling in the bottom, but yours might not be so full. I have had this large coffee container with these wipes in them for months and what’s left are still moist. Use like Clorox wipes all around the house. If you leave out the ammonia you can even use these to wash your armpits and your feet. I wouldn’t use them on any sensitive areas, but maybe you’re tougher than I am! 😉 I LOVE these. Easy on your pocket book and easy on the environment. IMHO it doesn’t hurt to have another container on hand to put the used wipe in until you have enough for a washing. It probably doesn’t matter if you throw the used wipes into the laundry basket, but I just don’t like that idea so I keep a separate container for the soiled ones. This is at home. 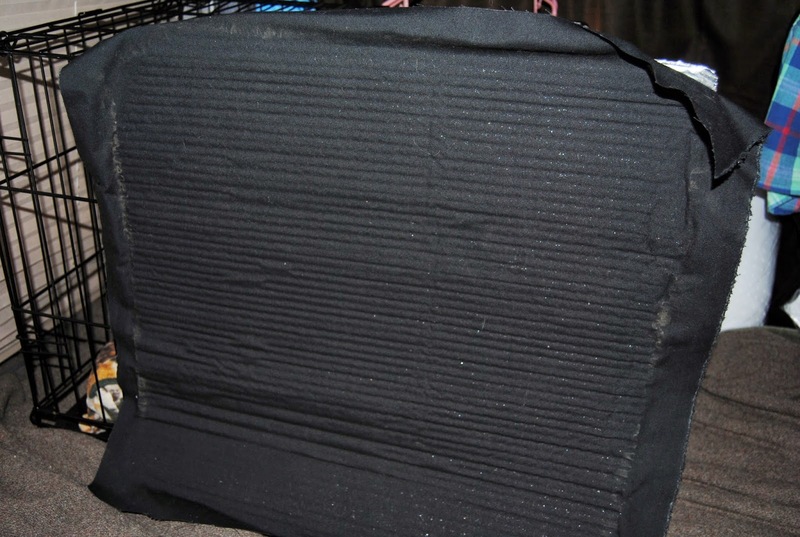 In the van the process is different; I wouldn’t hesitate to put these in with other dirty laundry. Save where you can, so you can spend where you want. Before I decided to combine Two Dogs and a Single Life with my van conversion, I bought the van (Phase One) and began Phase Two (converting her to be livable), so you are going to have to use your imagination on how she looked inside before I got my hands on her and started putting the dreaming and planning into action. I have this need to journal the process but I got ahead of myself and didn’t take inside photos. Freedom is a seven passenger vehicle: Front seats, two middle seats, and a bench seat in the back which also happens to fold down into a bed. This was very convenient as it meant one less thing to add to her and I could potentially take off on short trips right away since the necessity of a comfortable place to sleep was at the ready, just add bedding. My oldest son was the one who checked her out for me and took her for a test drive and then called and said “Mom if you are going to do this, this is the one. It’s mechanically sound and in very nice condition.” OK! Let’s get this deal done! Thank you Scott. My youngest son helped me get the two middle seats out and they are now in my grandson’s bedroom and he uses them as gaming chairs. HA! A dry place to store them and he has a a comfy chair in which to sit while playing his video games. Thank you Jeremy! So with the middle seats gone all that was left was to plug the holes where those seats were bolted to the floor and that was easily accomplished with some plastic plugs from the hardware store. I vacuumed the rug and then began measuring and taking notes and trying to envision what would go where, what I would need, etc. I have a file folder titled “The Van Plan” which had a few notes in it, but recently it has become stuffed with more notes and lists……the plan is in action!! 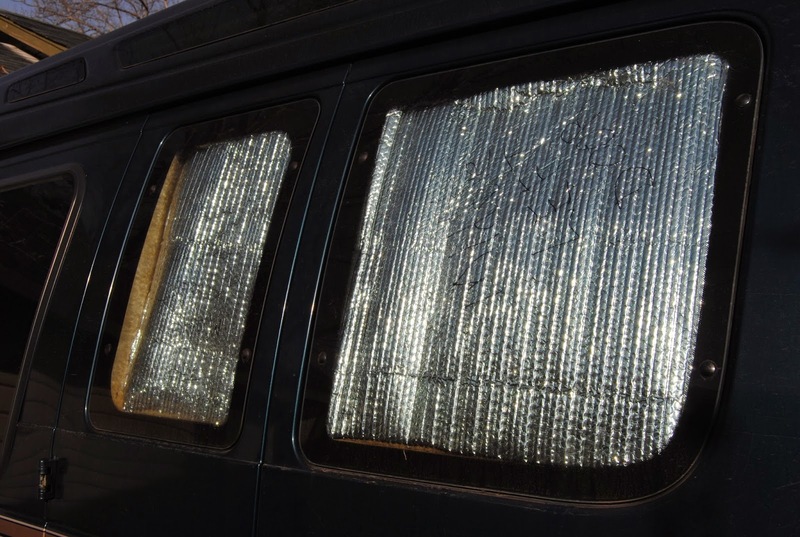 I knew I wanted to get some Reflectix for the windows to provide not only some insulation against heat and cold but also for privacy at night when parked. 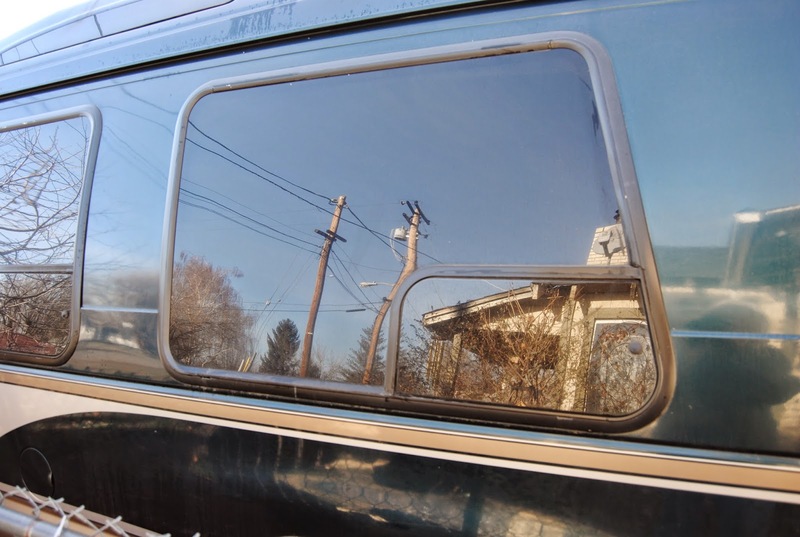 I had never heard of Reflectix until reading some very good blogs on vandwelling, namely Bob Well’s www.CheapRVLiving.com and all the wonderful members of this group who contribute and share what they have done in their vehicles (and trailers, camper shells, you name it.) There is a ton of information there and everyone is so generous with their knowledge. 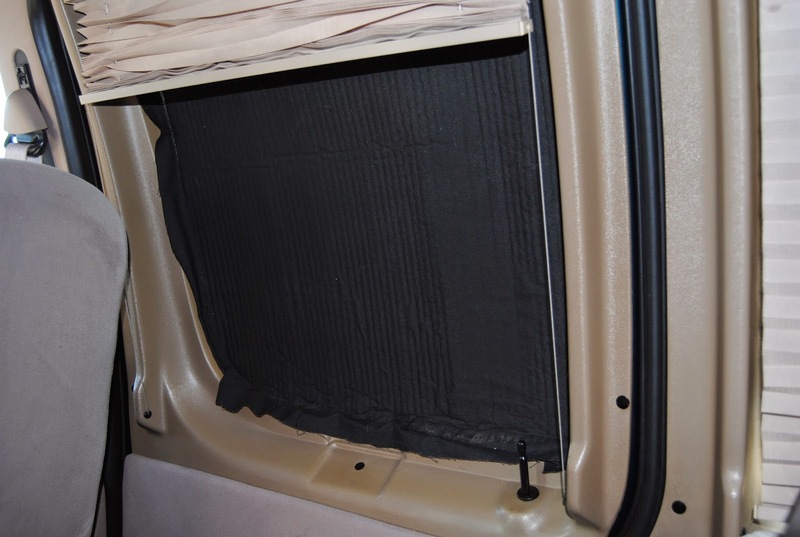 Also, the VanDwelling group on Facebook started by the lovely Brenda Curtiss. I am honored to be part of her Vanily. She also has a wonderful blog, www.LordandCurtiss.ws that has a ton of information for vandwellers along with some really good ebooks on the subject. I devoured all these sites had to offer, sometimes my head spinning with ideas or decisions or with just the shear magnitude of choices. So how to finance all these things I needed for living in a van? At present I am unemployed and there just isn’t any extra cash. The tentative plan is to perhaps one day actually live in Freedom, but even if I just become a Snow Bird, I will have to downsize. Bob’s suggestion is to start getting rid of things, and I felt that I should start now and not leave something like that to some last-minute-mad dash-going-crazy event, so, I began going through my home finding things that I not longer used, wanted, or needed and I posted them on our local Swap and Trade Facebook group to get some cash to get Freedom fixed up the way I want. This downsizing isn’t something that just popped in my head. I have been planning on downsizing and getting rid of a lot of things so that when the time comes my sons don’t have as much to deal with. I truly want to make it as easy on them as possible. If I am living in a van with nothing but what’s in Freedom, that should do the trick! I’m making jokes, but truly it’s a win-win situation for all concerned. If I don’t become a full time vandweller I have my home pared down to something manageable, and if I do become a full time vandweller, the extraneous “stuff” will be gone and the final dash to freedom in Freedom will be that much easier. So that’s enough for today. Once I get past the “beginning” my posts will not be so long and you can join me in the process of making my new travel home a haven of comfort and convenience; please bear with me. I leave with a couple of photos of the area surrounding the Burney Basin/Intermountain Area. It’s a gorgeous place! To seek and see and live life, rather than existing. This is part of the plan.